1 of 4 Heat broiler. Coat a broiler pan with nonstick cooking spray. 2 of 4 Cook orzo following package directions, about 9 minutes. Stir in spinach just before draining. Place in a large serving bowl. Stir in scallions, olive oil, lemon juice, zest, 1/2 teaspoon of the salt and the pepper. Cover with plastic wrap. Set aside. 3 of 4 Season pork chops with remaining 1/8 teaspoon salt. Spread mustard and evenly sprinkle Herbes de Provence seasoning over both sides of chops. 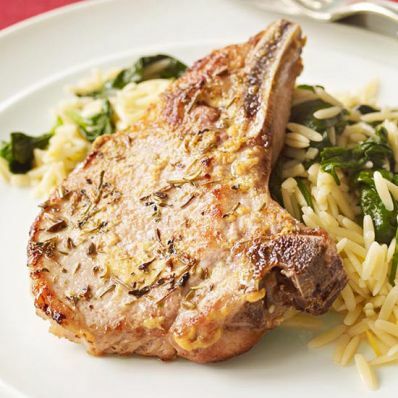 Broil for 3 minutes per side or until internal temperature registers 145 degrees F.
4 of 4 Serve pork chops with orzo and a green salad if desired.